This page is about the American utility helicopter UH-1B. For other uses, see UH-1 (Family). The UH-1B is a Rank V American utility helicopter with a battle rating of 9.0 (AB/RB/SB). 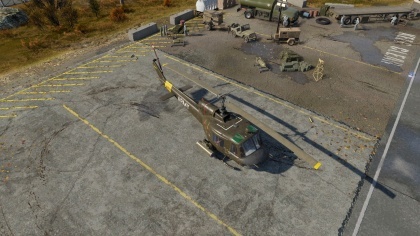 This helicopter was introduced in Update 1.81 "The Valkyries". Helicopters have a unique role on the battlefield and fitting them with armour is not as easy as it is on a tank or on a jet. The helicopter's setup is such that it must take off and land vertically, hover and fly and as the aircraft gets heavier, bigger and heavier equipment are needed to balance until you are left with a massive helicopter which cannot fly or do its intended mission. The Huey balances this out with a vehicle which can manoeuvre as needed and carry a decent payload whether people or weapon systems. The UH-1B does not fly with any protective armour or bullet-proof glass, which if installed would decrease the UH-1's ability to complete its mission. As such, the pilot must take this into account and fly the helicopter accordingly. Bull rushing right into the middle of a battlefield usually ends with disastrous results as the without armour, the Huey has nothing but thin metal fuselage coverings to protect the crew and vital equipment. The engine, transmission, main rotor and tail rotors are all exposed to fire from missiles, rockets, cannons and even small calibre machine guns. The pilot must be aware of their surrounds and work to fight from the enemy vehicles blind spots or weak sides, because a burning and crashed helicopter only pads the enemies' score-count. Pick and choose your battles to preserve the helicopter. As Lt. General James M. Gavin quoted George Patton as saying, No dumb [soldier] ever won a war by going out and dying for his country. He won it by making some other dumb [soldier] die for his country. The same holds true in War Thunder. The UH-1B can be outfitted with the nose turreted M129 Grenade Launcher after researching and purchasing the tier II Weaponry module M129. The M129 is a grenade launcher which can fire 40 mm grenade shells at the rate of 400 rounds per minute with a muzzle velocity of 850 ft/s (260 m/s). An upgrade from the old M75 and redesigned, the torque produced from firing the weapon was eliminated and recoil was greatly reduced. To ensure safe operation of the M129, when the trigger finger releases the firing trigger, the launcher automatically recenters itself and points forward (safe position) before firing can be resumed. A side view of an UH-1B with a side mounted FFAR Mighty Mouse rocket launcher. The UH-1B is a real workhorse utility helicopter which can pack a punch with several different weapons load-outs and configurations utilising rockets, guns and missiles. Selecting a single type of weapon to fly into battle with or mixing it up will allow the pilot to mix and match as necessary for the upcoming fight. The M134 with it's almost 6,000 rounds-per-minute fire were an early fixture to helicopters as they can fly low and slow allowing them to pivot on the battlefield as necessary to take out personnel and light armoured vehicles. While initially not doing much damage being rifle calibre bullets, if the enemy does not move to avoid the fire, they will start taking on more and more damage. The M134 is also good for clearing trees and exposing hiding positions of armoured vehicles providing a better shot for harder hitting weapon systems. Due to weight and recoil issues of autocannons, helicopters typically have a workaround which allows them to have similar firepower without the drawbacks. The UH-1B can be outfitted with the FFAR Mighty Mouse rockets which just needed to be aimed at the target and fired. The Mighty Mouse rockets, when launched, have fins which flip out to spin-stabilise them and guide them in as straight of a path as possible without any further guidance. While a single rocket can inflict some severe damage including shooting down bomber aircraft, typically one rocket will not be enough. Effectively the rockets work like a cannon with a shotgun pattern, where they pack a punch like a cannon, but have the accuracy of a shotgun and typically requires firing off several at a time to ensure a few will hit the target. 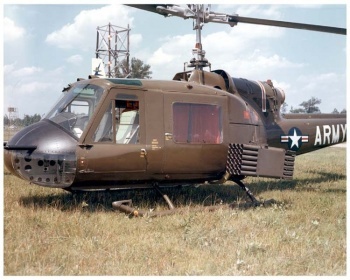 The UH-1B can be outfitted with two amounts of the rockets, either 38 when stock or mixed with an M134 Minigun load-out or a total of 78 rockets when utilising them on both pylons. With the ability of the helicopter to swoop in and reorient towards a target in a matter of seconds, rockets can be streaking towards their target before the enemy has the chance to either notice or even swing a gun around to counter. Mighty Mouse rockets pack a punch, however, may not have enough ummph to get through some of the thicker skinned vehicles found on the battlefield. 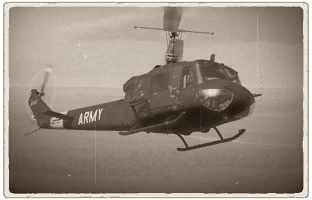 Not without a heavy-hitter, the UH-1B can dish out damage with unguided rockets; however, to tackle some of the armoured goliaths rolling around on the battlefield, it needs something bigger! To meet this need, six AGM-22 manual to command line of sight (MCLOS) wire-guided anti-tank missiles are installed. Knowing the location of an enemy tank allows the helicopter pilot to take evasive action while setting up to fire off a missile. Using structures and terrain as a shield, the helicopter pilot can fire off a missile and then guide it to the target without being a target itself. It is vital to fire, hit and then move as a sitting helicopter makes for an easy target and while guiding a missile to the destination, the pilot can get tunnel vision and not realise inbound threats to their position.